After my love affair with Tom Yum in Thailand I decided to stay in Southeast Asia and go to Vietnam. Vietnamese cuisine is famous for its healthy food, but I was happy to make an exception to that rule with these spring rolls. Vietnamese spring rolls can be filled with many different ingredients, usually some kind of mixture of pork, shrimp, rice noodles mushrooms, onions carrots and other vegetables. This recipe is a lot simpler though, it only contains shrimp & green onions. It originates in Southern Vietnam, but I found it on a great blog called wandering chopsticks. I love the simplicity of the recipe. It goes really well with the homemade chilly sauce. Making your own chilly sauce is a piece of cake, so please try it! Rice paper looks a little bit like a really big uncooked noodle. You put it in warm water to soften it. And then it's ready to go. Now the fun part, putting your rolls together! 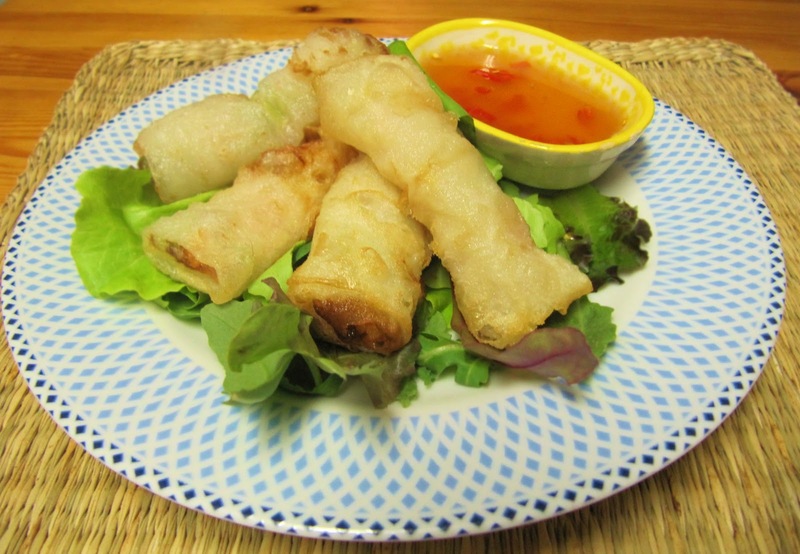 The color of the rolls will be lighter compared to golden brown wheat based spring rolls most people are used too..
Visit wandering chopsticks for more great vietnamese recipes! Sieht gut aus, let's meet binnenkort!